between an actor and an enemy and determines how the exp will be adjusted. This means that the amount of exp that an actor gains from an enemy is dependent on the difference between the actor’s level and the enemy’s level. 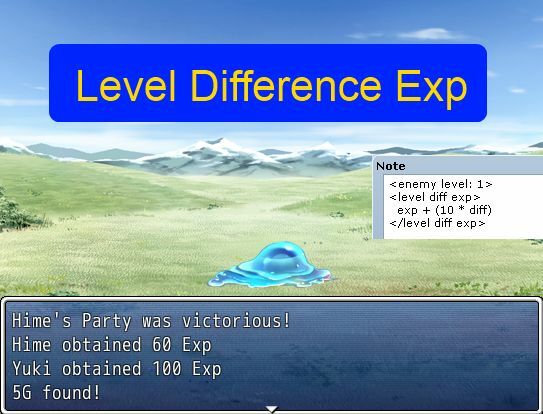 For example, if the actor’s level is higher than the enemy level, then the actor may receive less exp than if the levels were about the same. On the other hand, if the actor’s level is lower than the enemy level, then the actor may receive more exp than usual. If no formula is defined for the enemy, then this modifier does nothing. exp rewarded is just the usual exp. Is there an MV plugin version of this? Would there be any way to set a “default” formula, to avoid having to set the same formula to all enemies noteboxes in the database? Easiest way is to go to line 125 in the script and change the formula there. It says “exp” by default, which means the base exp the enemy provides, but you can change that as needed. I’m using Soulpour777’s Singular Experience script. Can this script work with it? Will it still require your Actor Victory Exp script, and if so will that work with it? If not, do you expect it would take much modification to get them to work together? Yes, Actor Victory Exp makes it so that each actor will evaluate how much EXP they get separately. I don’t think there should be an issue between these scripts, since only the leader would get EXP. I was wondering if ever did the patch to make this compatible with yanfly’s victory aftermath script? No, I don’t know if I will do one. I was wondering if you had made any progress on a patch to make this compatiable with yanfly victory aftermath. and when it’s tested, you gain 0 exp, and ‘___ gained _ exp’ isn’t displayed. Do you have the required scripts placed above? I do. Then after a long time being frustrated and trying various different formulas, I realised that I also had a script from someone else and it must have been incompatible with yours and that was the problem. I like the idea of your script but I already have Yanfly ennemy level and Victory aftermath… I fear some incompability if I take the required scripts >_<"
Yes, actor victory exp is not compatible with yanfly’s victory aftermath. However, I have found that yanfly’s script provides similar functionality so maybe I can write a patch. You can use yanfly’s enemy levels script.